This handcrafted bowl contains 61 pieces of exotic wood: Canary wood and Pau Amarello. 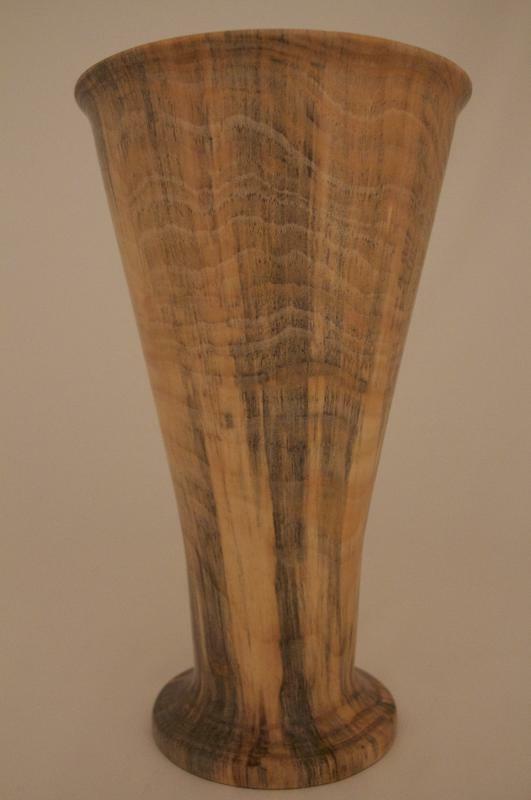 The veins and grain change as the piece is turned. The shape adds interest also. 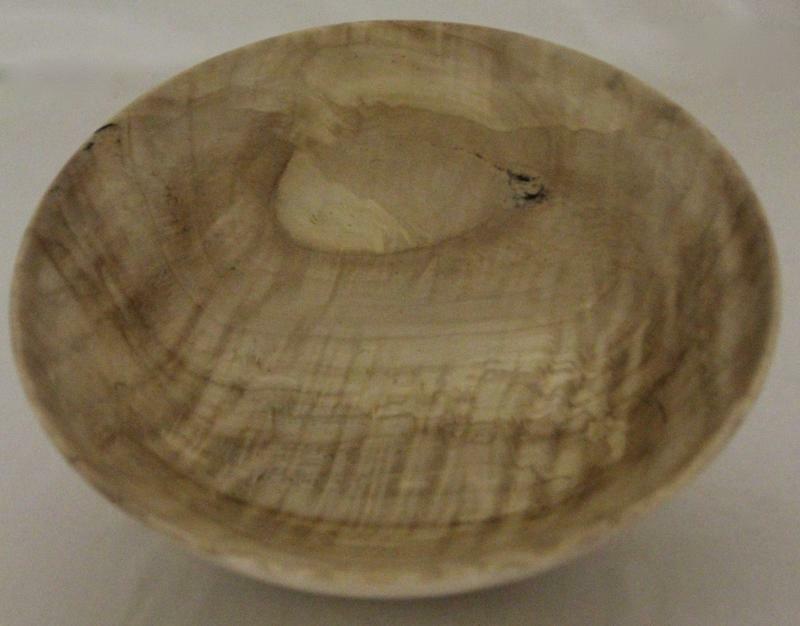 This handcrafted bowl contains 61 pieces of domestic wood: Walnut and White Ash. The veins and grain create the interesting affects as the wood is turned. 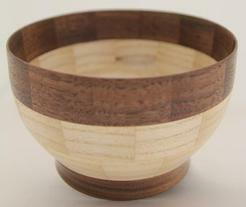 This handcrafted bowl contains 61 pieces of exotic and domestic woods: Canary wood and walnut. Turning the piece presents the interesting design. 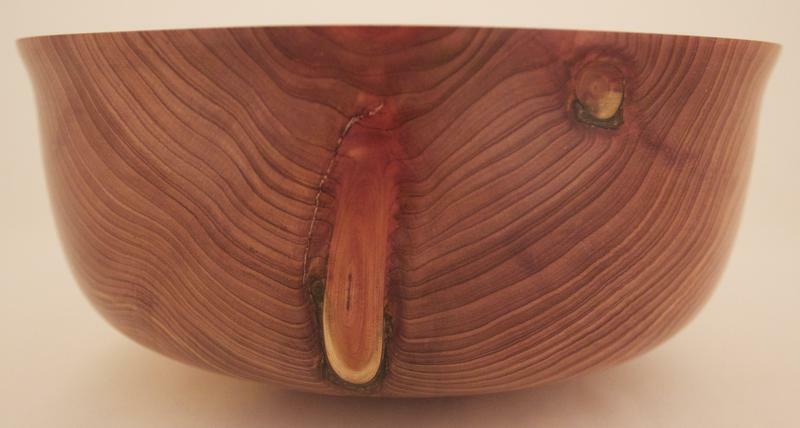 This handcrafted bowl contains 49 pieces of wood. Exotic wood: Zebra wood and domestic wood: walnut. 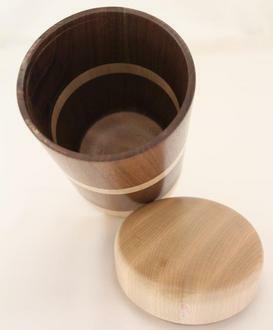 The interesting design occurs as the wood is turned. This bowl has a southwestern flare. It is made of 235 pieces of domestic woods, white ash and walnut placed with great precision to create this intricate design. 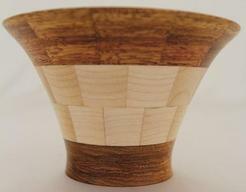 The grains also add to the intricate design of the bowl. The inside is also beautiful and the grains are slightly different since the grains vary throughout wood. Please note the NEW items on this page. Some of these items are for sale in the store. If you see something on this page that is not in the store please CONTACT US with the information regarding the item you desire. The sold pieces are samples that could be made but the grain may be different as well as a variation in color. We welcome your thoughts for personal designs with a custom order and consultation. Please CONTACT US regarding an order. 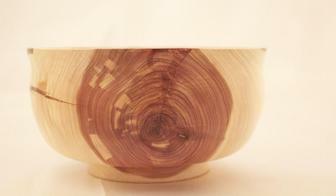 ​This bowl of domestic woods: walnut and white ash has 181 pieces of wood. The small pieces of wood are placed with great precision to obtain the intricate pattern. 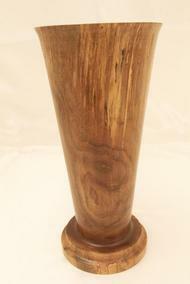 Pine has very interesting grains that accent the shape of this vase that measures 6.75" dia. 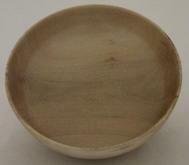 x 11.5" H.
This bowl has 109 pieces of wood. 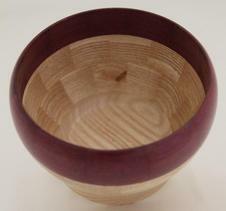 The shape of the bowl is accented by the delicate rings and the base of Zebra wood. The remainder of the bowl is white ash. 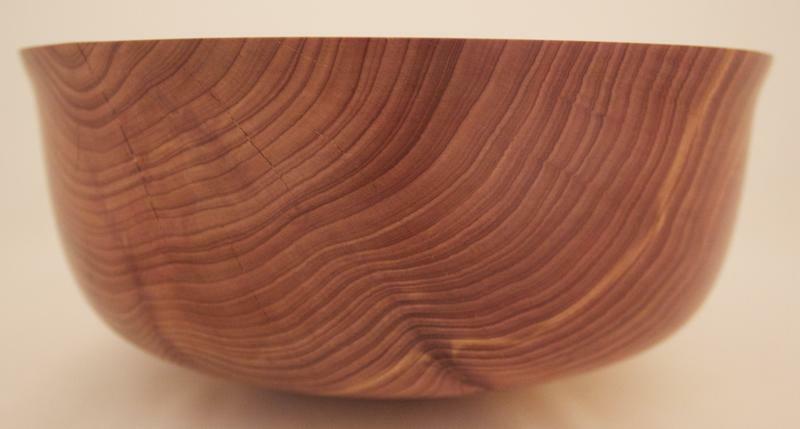 This bowl contains 19 pieces of wood. Walnut and white ash. The placement of the wood with the grain of the woods make it very interesting. This box has been turned from pear wood. The very interesting grain and veins accent the shape of the box. 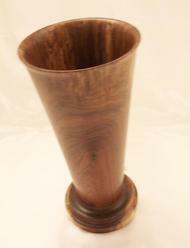 The grain and veins of cedar a domestic wood adds a great deal of interest to this goblet. The shape accents the grain. The shape of this bowl is very conductive to many uses. This is a sample of shape and size. 7" dia. x 3"H.
19 pieces of wood, exotic: Panga Panga and Purpleheart and domestic: white maple arranged in this pattern create a unique appearance with the grain of the woods accenting the pattern. The 19 pieces of wood exotics: Purpleheart and Zebra wood and domestic wood white maple create a very unusual design when placed in this arrangement. The grain of the Zebra wood is very pronounced. 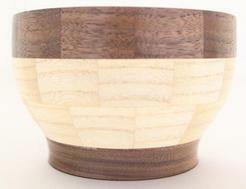 ​The 19 pieces of wood in this bowl are exotic Canary wood and domestic woods: walnut and white maple. The colors, grain, and arrangement compliment the design. 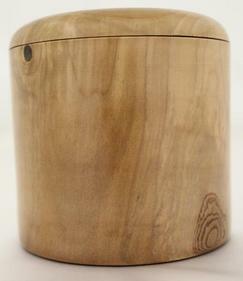 The lidded box to the right is made of walnut and white maple. The grain accents the shape of the box. 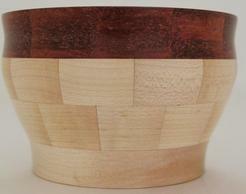 The four bowls all have domestic wood, walnut on the upper edge and base. The first three have Ambrosia Maple in the body, the forth has ash in the center. 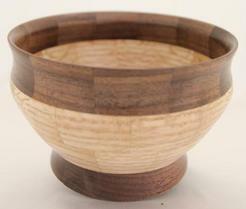 Each bowl contains 37 pieces of wood. The measurements are approx. 4" dia. 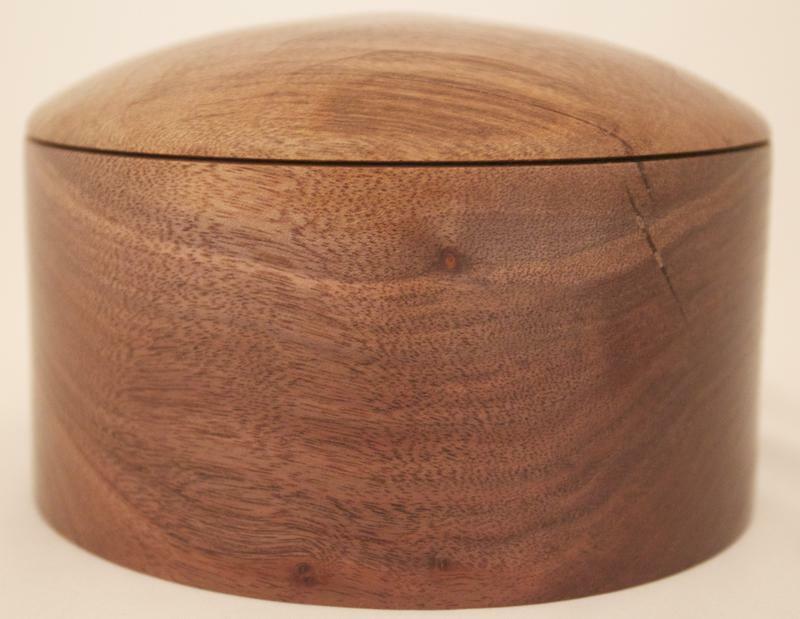 x 3" h.
The two bowls above contain domestic woods: walnut and white ash. 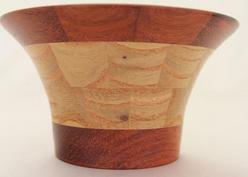 The gain of the woods after being turned are very interesting and are accented by the shape of each bowl. Each bowl contains 37 pieces of wood. The measurements approx. 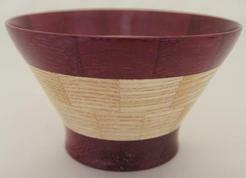 4" dia x 3" h.
The two bowls above contain an exotic wood Honduras Redheart and domestic wood white ash. 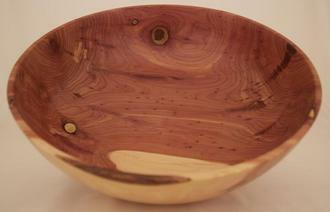 The shape of each bowl differs slightly accenting the grain of the woods. 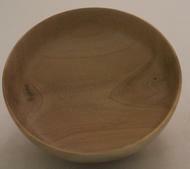 Each bowl contains 37 pieces of wood. Measurements: approx. 4" dia. 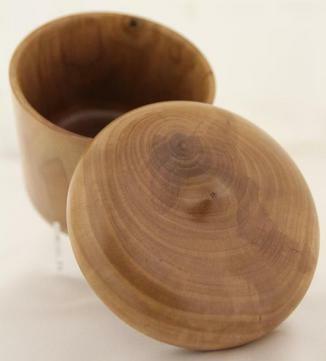 x 3" h.
The two bowls above contain exotic wood Canary wood and domestic wood white maple in the center of the bowl. The distinctive shapes of each bowl accent the grain of the woods. Each bowl contains 37 pieces of wood. measurements 4"-5" dia. 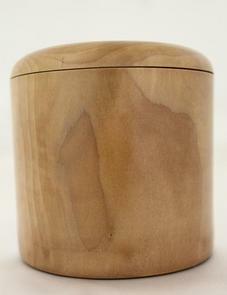 x 3" h.
The three bowls above contain exotic woods: Paduck and Canary wood. 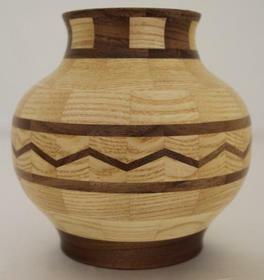 Each has an unique shape that is enhanced by the grain of the woods. 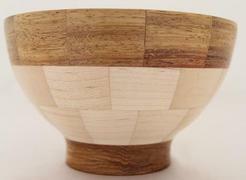 Each bowl contains 37 pieces of wood. Measurements 4"-5" dia. 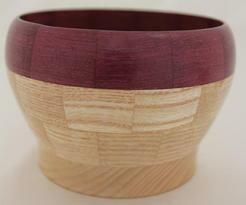 x 2.5" - 3" h.
The three bowls above contain exotic wood Purpleheart and domestic wood white ash. The arrangement and shape of each bowl gives each one an unique appearance accented by the grain of of the woods. Each bowl contains 37 pieces of wood. Measurements are 4"-5" dia. 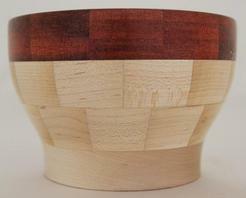 x 3" h.
This handcrafted bowl contains 61 pieces of exotic woods: Bloodwood and Canary wood. As the bowl is turned the grains appear and add interest. The shape accents the grain. 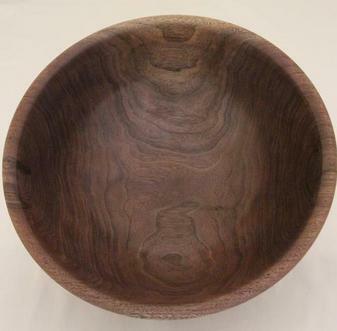 This bowl has been turned from Walnut. The grain changes as the wood is removed. The colors are truely amaazing. The colors develop as the tree grows and repairs itself. This bowl has a food safe finish. 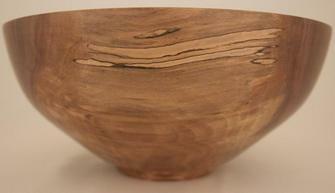 It measures 11.5"dia x 5.5"H.
This Walnut bowl came from the same log. It is always interesting to see how the grain changes throughout the log. This change is not noted until it is turned. The shape of the bowl accents the grain of the wood. It measures 11"dia. 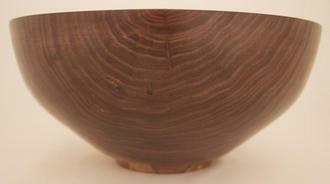 x 4.75"H.
This bowl is also from the same log of walnut. Again the grain is different due to where the limbs occur. As it was turned it was enhanced by a decorating tool. It adds more visual interest. 10"dia. x 4.5"H.
This is Walnut also. It also has interesting grain, but the creamy yellow does not show in this piece. 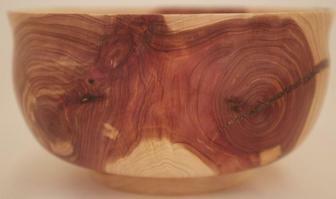 5.25"dia x 1.5"H.
This cedar bowl displays some of the beautiful grain that cedar has. Plus the aroma is very nice. The knots add visual interest to the piece. 9.5"dia. x 5"H.
The yellow streaks of the cedar continue to be very interesting. It is always a challenge to maintain a good thickness and get the grain that is beautiful to show. 8.5"dia. x 3.5"H.
The very wide grain and knots of white pine remain very interesting. At the right angle it would appear to look like a face. The size and shape of this bowl lends itself to many uses. 7.5"dia x 3.5"H. $50.00. White pine from different logs as well as the same log will have very different areas show up when turned. 6.5"dia. x 3.5"H.
White pine frequently has knots when viewed at certain angles appear to be a face. This could be really fun at halloween. Pear has a rich golden color and has very interesting streaks in it. This bowl will be useful for many things. This bowl measures 6" dia. x 2"H.
There is a great deal of veining and streaking in this bowl. Again the knots where branches had been leave very interesting areas. 6.5"dia x 2"H.
Pear has a very tight and wavy grain. The movement of the tree as it grows creates very interesting changes in the wood as noted in the pictures above. The shape lends itself to many uses. This bowl measures 10.5"dia. x 3"H.
When Pecan is turned it displays very tight but interesting grain. The colors are amazing also. The shape of this bowl makes it great for many uses. This bowl measures 9.5"dia. x 2"H.
This shallow walnut bowl shows a lot of grain. Shape adds interest. 5"dia. x 1"H.
Knots in the walnut add interest visually as well as a challenge to the woodturner. 8.5"dia. 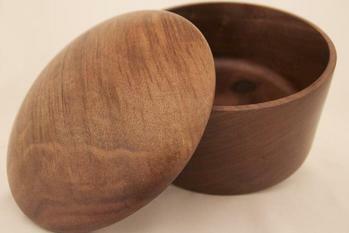 x 3"H.
This walnut bowl is similar to the one below but the shape is slightly different. It is more open and the base is slightly shorter, 5.5"dia. x 1.5"H.
This is a fun little walnut bowl. It has a small amt of the golden yellow on two sides and is visible on the inside. 5.25"dia. x 1.75. There is more streaking in this bowl. The areas where the branches were leave very interesting areas. This bowl can be used for various purposes. 5.5"dia. 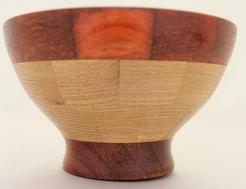 x 2"H.
The beautiful grain is present in this bowl. The outside has been enhanced with the texturing tool. 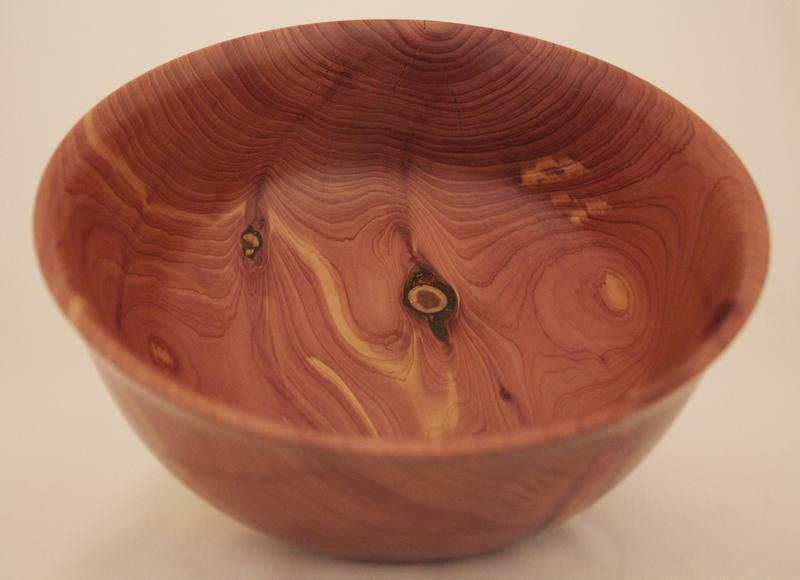 5.5"dia x 2.75"H.
The swirls of the grain in this bowl are truly beautiful. The shape adds interest also. 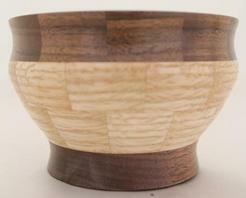 5"dia x 2.5"H.
The shape of this bowl accents the beautiful grain. The swirls are amazing! 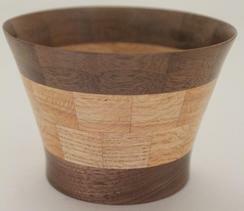 4.25"dia x 2.75"H.
This poplar bowl has amazing grain! The wavy grain known as "fiddleback" which is not always seen in this wood. The shape accents the beautiful grain. 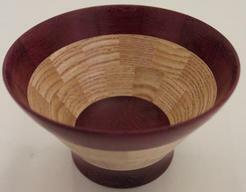 10"dia x 4"H.
The 2 bowls above are Figured Poplar. The figured poplar is unusual due to the amount of figuring that occurs as it is growing. As you can see the grain is different in each one. Also, they have been shaped differently while being turned adding to the visual and tactile interest. This bowl is # 428. It measures approx. 10.25"dia x 4.5"H. It is $60.00. 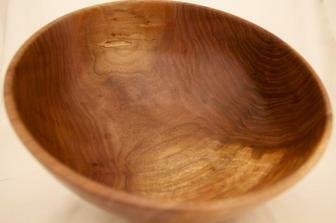 This Walnut bowl has amazing grain and color. 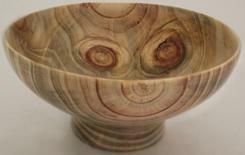 The sapwood (light wood) is slightly spallted adding a great deal of interest to the bowl. 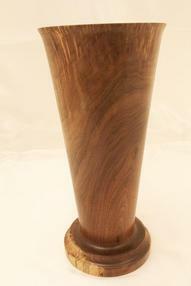 There is a slight mauve iridescence which is very unusual in Walnut. The shape makes it very suitable for a salad. It is approx. 10"dia x 4.75"H. It is $70.00. 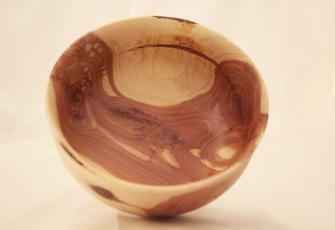 This walnut bowl has a beautiful grain and color. The mauve, which is unusual for walnut makes it amazing. The shape of the bowl adds a great deal of interest to the bowl. It is 11.5"dia x 5.25"H. It is $110.00. The colors in this Apple wood bowl are amazing!!!!! 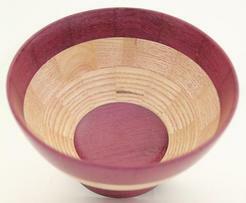 The shape when turned enhances the colors and adds interest to the bowl which has a food safe finish. It is 5.5"dia x 3.5"H. It is $50.00. 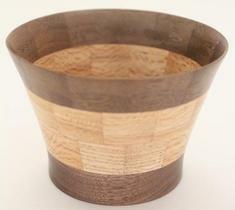 This segmented bowl has109 pieces of Zebrawoood (exotic) and White Ash (domestic). 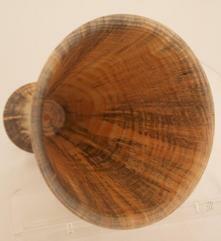 The grain of the Zebrawood is very dramatic when it is turned, giving it the scalloped look. The White Ash has a much more subtle grain but also shows some scalloping when turned. 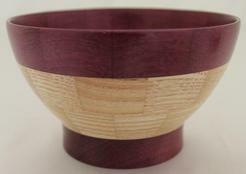 The shape of the bowl accents the grain a great deal. 10" dia. x 6.5"h.